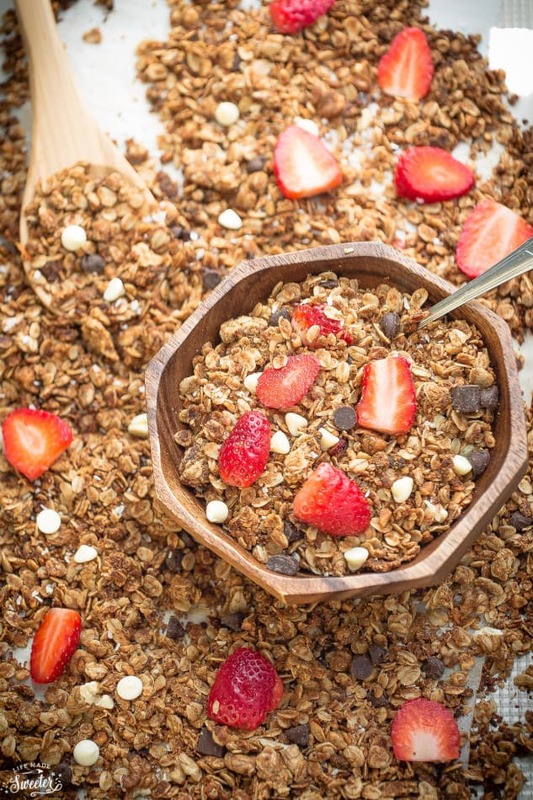 Strawberry Double Chocolate Granola makes the perfect gluten free breakfast or snack. Loaded with crunchy clusters, shredded coconut, white and dark chocolate chips along with freeze-dried and fresh strawberries. 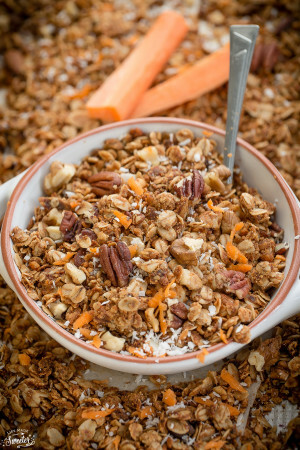 One of our favorite snacks I make every week is a big batch of granola. It’s so simple to throw together and much better for you than the ones you can buy in the store. Plus depending on how you feel, it’s super easy to switch up the flavors to what you have on hand. My kiddos are granola monsters so they are always dreaming about the most amazing combos we can stir up next. 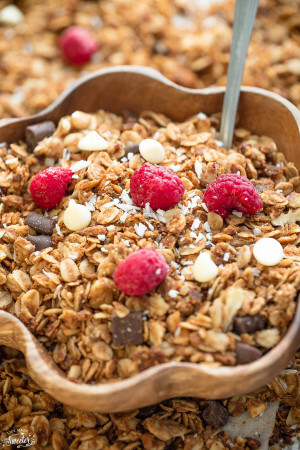 —> Carrot Cake Granola, Gingerbread Granola Clusters , Raspberry Double Chocolate Granola. 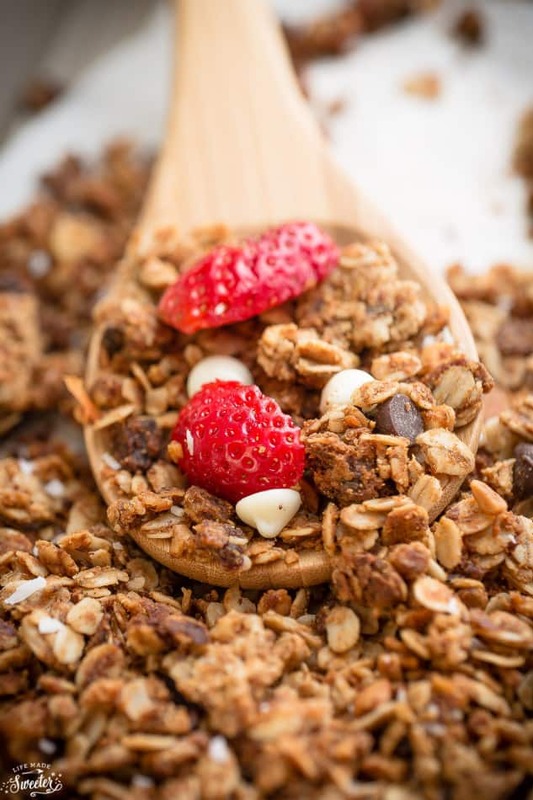 My son even got to help me make this Strawberry Double Chocolate Granola and I have to say it was one of our favorite granola batches we’ve made in a while. It’s chock full of shredded coconut, a touch of honey along with a mix of dark chocolate and white chocolate chips along with freeze-dried and fresh strawberries. Serve it plain with some sweet fresh strawberries or sprinkle it over your yogurt or with a splash of milk. 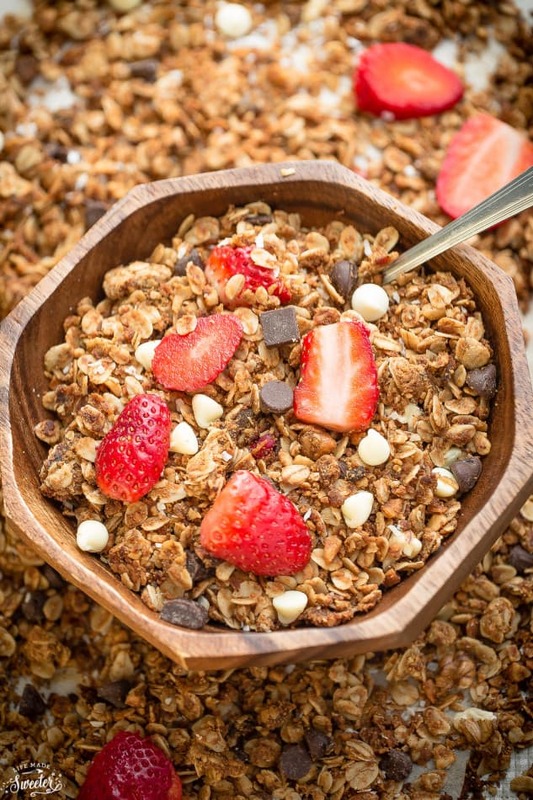 Strawberry Double Chocolate Granola makes the perfect gluten free breakfast or snack. So easy to make & full of crunchy clusters. In a large bowl, combine the oats, coconut, almonds, coconut sugar and salt. In a separate bowl, whisk together the melted coconut oil, honey and vanilla extract. Pour over oat mixture and stir until just combined and moistened. 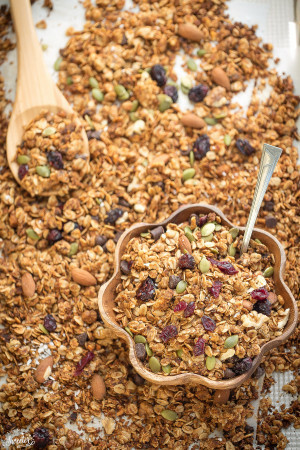 Spread granola in an even layer onto prepared baking sheet and pat down flat with a spatula or your clean hands. Bake in preheated oven for 40 - 45 minutes or until golden brown, rotating pan halfway through. (Do NOT stir granola while baking). Once cool, break granola into clusters and transfer to an airtight container. Stir in freeze-dried strawberries and all the chocolate chips. Serve with yogurt, fresh strawberries or fruit of of your choice. Disclosure: This post is created in partnership with the Hamilton Beach Ambassador program. The opinions shared are 100% my own.